Discussion in 'Off-Topic' started by Zkribbler, Jun 4, 2018. And how do you counter the tyranny of the plurality? If you're going to replace the system you'd better have your replacement prepared in advance. There are a couple of different alternatives that would be better. You could just apportion Senators according to state population, turning it into a sort of statewide version of the House. My preference would be making it into a proportional-representation body for the nation at large. That defeats the intended purpose of having all advantages accumulate to the largest population centers. Now, if you are suggesting that having such an accrual occur would be a good thing, fine, but you should just say so. We could go to a House number one, House number two system, or just go straight single house parliamentarian and be done with it. While the outcome is often irksome, I respect the reasoning, myself. Even though as a Californian I have more validity in any complaints I might register than anyone else would. While Beto O’Rourke’s bid to oust Ted Cruz for a US Senate seat may have stolen midterms headlines this week, another “Texas miracle” was under way in Harris county, where 19 African American women ran for judge – and all won. According to figures from The Gavel Gap, an analysis by a progressive legal group, the American Constitution Society found white men make up 30% of the Texas population but 58% of state court judges. “Equal opportunity for justice regardless of who you are – I think that with having an African American judge, a female judge, a woman judge, those are the kinds of things that we bring to the bench. And we bring an understanding of a person who may come from that similar background,” Latosha Lewis Payne, a judge-elect, told Fox 26 local news. “We want to definitely turn Harris county upside down in criminal justice reform,” Erica Hughes, who was elected to a criminal court position, said in a Facebook post. Democrats won all 59 judicial races in Harris county in Tuesday’s midterm elections. In one of the most eye-catching and significant results, the longtime incumbent Republican county judge, Ed Emmett – in effect, the county’s chief executive – lost to Lina Hidalgo, a 27-year-old first-time candidate who immigrated from Colombia as a teenager. The morning after the election, Glenn Devlin, a juvenile court judge in Houston who is one of the defeated Republicans, reportedly released most of the defendants who appeared in front of him after asking them whether they planned to kill anyone. “Apparently he was saying that’s what the voters wanted,” Steven Halpert, a public defender, told the Houston Chronicle. Birdjaguar and Lexicus like this. Is this a response to me? If so my preference would probably be for turning the Senate into a proportional representation body. Flawed as it is in implementation I like the idea of representatives being responsible to their districts, and I think a district-based House more or less as it currently exists combined with a proportional-representation body that serves the nation at large would be the best way to go. I don't agree that adhering to the one-person, one-vote rule makes "all advantages accumulate to the largest population centers." It makes all advantages accrue to people as people, rather than as residents of this state or that state. I still agree with the concept of the senate but would do one minor tweak. Have a population limit that if your state is below it you only get 1 senator. This would keep most of the original intent but also bend to the reality of the really larger states. To me that's better than merging or splitting up states. Tell you what, let's add up the 2018, 2016, and 2014 Senate popular vote totals. That way we get a 50-state sample, representing all 100 seats. I'll treat the California elections as if the losing Democrat was a third-party candidate, not adding their votes to either party's column. If you want, I can be more charitable to the Republicans by acting as if the losing CA Democrats were actually Republicans. This would add 7597 thousand votes to the GOP column, changing the percentages to 51.2% - 48.8% in the Dems' favor. No matter how you slice it, the Democrats won the Senate popular vote and had this translate to 46-47 seats, depending on how Arizona works out. So we'll take those 105845k and deduct both votes, both times, all four democrats. That's -3699k, -5222k and -1855k, -2009k. -1594, -4244 vs. -2855, -4244. That's the Senate without New York, California and Texas. We still have to pick our second Republican state to be fair. Go ahead! Pick one! Whichever one you want. You won't. You know well enough that you'll make up a million at best. Either the Senate is about representing states and it is wholly irrelevant how blue exactly NY and LA are. Or you feel the Senate should be about proportional representation and not about representing the states. That's fair, but why would you not want to fix the House first? That strikes me as the more intuitive approach. You can split the country into two electoral districts: NYC and LA county on one hand and the copulating rest of the country on the other. Clinton won the one, Trump the other. I'd be willing to side with you there. This however is a bigger strech. What's the point about having states, and ones that can write ciminal law (plenty entities in other federations can't do that) if you don't have them represented - disproportionatly - in an upper house of parliament? Just have a unitary state then! Which judgeships do they elect in TX again? I dunno rah. I'd split the bigger states to give them more equal representation. Would help mellow out disparate impact of varying state regulation when it comes to cross border commerce as well. Messing with Senators encroaches pretty hard on the democratic institution that drives a lot of our nationwide progress. As mentioned by Z, a lot of ballot initiatives that were progressive 5 years ago got snapped up this week in red states long before the Fed will move on them. I mean, he sounded a little frustrated, but that's what victory of an idea looks like. If something is good for residents of California it should have plenty of advocates in the House. If something is good for the residents of Wyoming, not so much. The senate is designed to counter that reality, and seems a reasonable idea. @Timsup2nothin who won your house district? There are still 70-90k uncounted ballots in my district. Looks like Porter is going to unseat Walters. I don't really agree that interests break down this way though. Rural people in Wyoming have more in common with rural people in California than rural people in California do with urban people in California. Hrothbern and Phrossack like this. Doesn't Walters lead by 4k votes ? Do the late ballots usually lean democratic so much that Porter will make up for that lead ? Rohrabacher and Knight look like they're toast though. There are still 70-90k votes uncounted out of roughly 250k. This makes me a bit frustrated that all of the media (save NY/LA Times) called it so soon for Walters. By 9pm on election night every news outlet called the race and none have said anything to the contrary over the last 4 days. Basically, early voting is dominated by the elderly in this area; later (but not late as in voting after the election ended, just right before) voting dominated by the young. Katie Hill First time my district elected a Democrat in my lifetime. AdrienIer, hobbsyoyo and Phrossack like this. (CNN)A discrepancy in the number of votes cast for governor and senator in Florida in Broward County is raising questions about the ballot design there, as the vote-count margin in the two big races continues to narrow. A CNN analysis of votes cast in Broward County suggests that ballot design could be responsible for a substantial difference in the number of votes cast between the race for governor and therace for senator in Florida, meaning thousands of voters there may have missed their chance to weigh in on the still-undecided Senate race. The placement of the Senate race on the ballot could have made it easy to overlook. Overall, as of Friday, nearly 26,000 voters in the county had cast ballots for governor but skipped voting in the Senate race, according to a CNN analysis of precinct-level results. Broward County became infamous for vote-counting problems during the 2000 presidential recount. Broward is a Democratic-leaning county. Among those who did vote in the Senate race there, 69.1% backed incumbent Democratic Sen. Bill Nelson, while 30.9% backed Republican Gov. Rick Scott. Gubernatorial candidate Andrew Gillum topped Republican former Rep. Ron DeSantis in the county by a similar share of the vote (68% for Gillum to 31.3% for DeSantis), but Gillum earned about 10,000 more votes from the county than Nelson received. 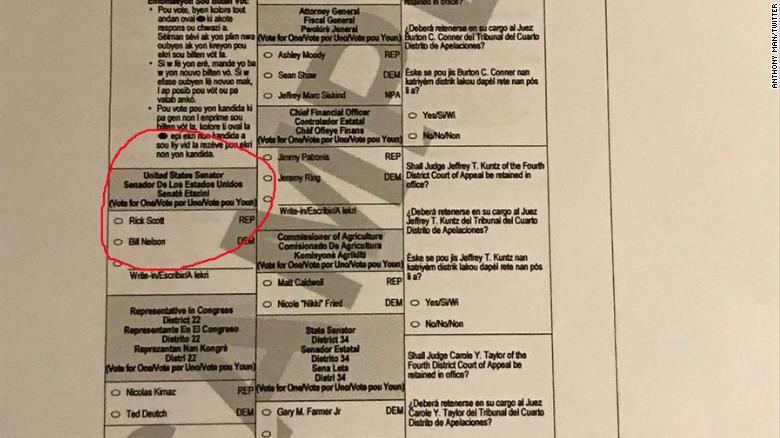 Photos shared on Twitter of the ballot used in Broward show the races for Senate and the county's congressional districts in the lower left corner of the paper ballot, below lengthy instructions on how to vote. The candidates for governor were listed more prominently to the right of the instructions. They didn't seem to feel that way when the Republicans made California state taxes no longer deductible on their federal taxes. There was every reason for a republican representing Wyoming to accept that amendment, but my congressman sided with the GOP against the interests of everyone in California. Hence he is the first GOP congressional candidate to be defeated in my district in half a century. Thanks for finally going too far GOP. They are not bad ideas on principle, but the whole point of bicameralism is that proportional representation is restrained so that tyranny of the majority cannot ensue. Have you read abotu sociocracy yet, or did it get buried among the hundreds of posts that flooded the forum? I posted it right before/during the election. Also, it must be pointed out that unless you displace the thousands of crooked-and-or-fanatical people who are gaming the current system then you'll just end up with them gaming whichever system you replace it with. I'm not sure, but black judges being elected in a former slave state illustrates the change, don't you think? Has anyone seen any kind of compilation of results at local/state levels? I can't even find such for California, and I'm not up for rooting through each and every state senate and state assembly race to sort out a net change...in my own state. I sure don't want to track it down times fifty, but I'd really like to know how much change there was in state house control. Last years resounding overturn of the Virginia state assembly was the highlight in how badly Trump had damaged the GOP, and I'm hoping to see a lot more evidence of that this time around. I went on the url you gave and couldn't find anything about sociocracy. So there are about as many elected Republicans as in Old Mexico?